Ping Pong or Table Tennis? The Playback 19 Rollaway table tennis table by Butterfly Table Tennis is an economical choice ideal for schools, recreation centers, sports clubs or heavy-duty home use. The Butterfly Playback 19 Rollaway has a 3 year warranty that combines a durable steel frame with a beautiful wood finish to ensure years of enjoyable play. The 19mm or ¾” top provides excellent bounce and is available in colors of blue or classic green. This ping pong table has a 1 piece design that is designed so players can fold-up the table tennis table into playback or storage position without the hassle of removing the net. The ping pong table has two safety levers on each table side provide an effective child safety feature. Each side has 2 legs that fold into the top for easy movement and storage. The Playback ping pong table has four rotating wheels for easy transporting into your storage area. A Butterfly ping pong net set is provided, which attaches to the table and remains in place during play, playback, and storage positions to eliminate misplacing or damaging your ping pong net. 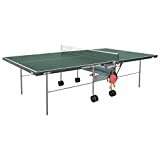 Enjoy playing on this excellent table tennis table indoors at a great price for high quality fun – Butterfly Playback 19 Table Tennis Table. 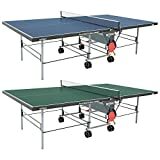 The Personal table tennis table by butterfly table tennis is the ideal choice for those looking for an excellent table at an affordable price. The Butterfly Personal ping pong has a 3 year warranty, providing countless hours of fun without the hassle. The 19mm top provides excellent bounce and playability and is available in the traditional green color. It is protected by a strong steel frame with corner pieces to protect the ping pong table. The table tennis table has four rotating wheels making it easy to transition the table into play or storage modes. A safety locking mechanism prevents the table from opening or closing accidentally, which is great with kids around. Another popular attribute of the Personal ping pong table is the playback feature where one half can be set in the storage position, providing the opportunity for extra practice when a partner is not available. The Butterfly ping pong net set is provided, which stays attached to the table during play, playback, and storage positions. This is convenient, so you do not have to remove the net after each use with the fear of losing it. The table is made of high quality parts from Germany. Butterfly is the most popular table tennis brand worldwide. Enjoy playing on this classic table tennis table by butterfly table tennis.